So, you want to start a blog? Or have you already started one and are looking for ways to make it better, easier, more fun? Then read on, my friends! I’ve compiled a list of blogger resources on a few topics from where to buy a domain to how to market your blog. If you are a fellow food blogger, no matter what stage your blog is in I highly recommend signing up for Food Blogger Pro. While primarily geared towards food bloggers specifically, there are still many helpful resources for any blogger on setting up a blog, hosting, marketing, plugins and more. You can sign up for your first month for only $1! You’ll have access to hundreds of helpful videos (including step by step on how to create and set up a blog) you can watch at your own pace on topics from picking a blog name, photography, marketing, and beyond. I guarantee you’ll be happy you signed up for this. Otherwise, scroll through the list of blogger resources and click on the title to whatever is relevant to you at the moment. I hope you find something helpful! Start brainstorming ideas for your blog name. Think of nicknames, favorite foods, or clever sayings to use for your blog. Think of your target audience, and if your blog will have a general theme. Generally shorter is better, as it is easier for people to remember. It’s good to have at least a few ideas in mind as many names are already taken. Once you have some names picked out for your blog, the next step is to reserve or buy the website! You have a couple options here – you can reserve a free site at blog websites such as wordpress.com or blogspot.com, or if you’re willing to spend a small amount of money, you can buy your own .com blog name. Unless you don’t plan on updating your site very often or don’t eventually plan to put ads up on your blog, I highly recommend going ahead and buying the domain name from the beginning, but you can switch from one of those free sites to your own domain later, if you’re not yet ready. I use my hosting company, Dreamhost, to buy domain names and it’s easy to search for available domains here. If your desired blog name is not available, consider adding the word “blog” to the end of it, or go back to brainstorming. If you buy your own domain, you’ll need to pay to have it hosted. I use Dreamhost to host my blog. I find it really easy to use, it has a 1-step wordpress install and has many helpful features to get you up and running. You’ll want to install the wordpress.org platform on your blog, most hosts should have a 1-click install. It can be confusing, the difference between this wordpress (.org) and the free blogging wordpress (.com). Here’s a good page that explains the differences. Once you install wordpress on your blog (here’s how to do it on Dreamhost), you’ll need a theme. (This is only available if you have your own domain, not a wordpress.com blog.) There are some free themes that come with your wordpress install to browse, but if you want to invest in a theme with some more options, I recommend StudioPress Themes for WordPress. Personally, I use and love the Cravings Pro theme (I used to use the Foodie Theme) from Feast Design Co. which runs off the Genesis Framework. The Genesis Framework is a platform that your theme runs off of, it integrates all the security and performance features to give you a stable and secure website. There are many other great options for themes within StudioPress as well. Feast Design Company also offers a Food Blogger Hosting package. Camera – You don’t have to have a super fancy camera to get started. There are many food bloggers who take pictures just with their phones and editing apps. However, if you do want to upgrade to a DSLR camera and are ready for an investment, I started out with (and highly recommend) the Canon EOS Rebel T3i with a Canon EF 50mm f/1.8 II Camera Lens. I recently upgraded to a Canon EOS 5D Mark III with a Canon EF 50mm f/1.2 L USM Lens , which I love but is a more hefty investment. I also use this tripod and this tripod head. Editing – Adobe Photoshop Lightroom is an amazing tool for editing your photos. Definitely worth the investment! Food photography tips –Tasty Food Photography takes you through lighting, camera settings, props and more about how to get your food photography looking good enough to eat right off the screen. Plate to Pixel: Digital Food Photography & Styling – the go-to book for food photography. Now that you have a blog, how do you get people to find it? Learn to market yourself with Pinterest, Twitter, Facebook, and Instagram. Pinning Perfect: This is a course from Blog Clarity on how to best market yourself on Pinterest. Lifetime access once you sign up and they are constantly updating the course with insider information! Tailwind is what I currently use to schedule my pinterest pins. This is really helpful if you don’t have time to be on pinterest all day every day! This link gives you a free month to try it out. Interact with other bloggers – comment on their recipes, follow them on social media, etc. Connecting with other bloggers is one of the best ways to not only get more eyes on your blog, but also a way to find other photography and writing styles to help you figure out what you like. I am constantly inspired by other’s blogs and stories. Conferences are also a great way to meet bloggers IRL – my recent favorites have been Everything Food (EFC in SLC), and Mediavine. Run a giveaway! A tool I’ve used and was super simple to set up was Gleam. It can be something as simple as an amazon gift card or your favorite kitchen tool. Foodgawker – Generally brings the most traffic but can be frustrating to get your photos accepted. Tastespotting – Another food submission site. Healthy Aperture – For healthy recipes. Finding Vegan – For – you guessed it – vegan recipes. Affiliates- Sign up for affiliate sites like shareasale and e-junkie (and amazon if your state allows). Promote products you love and get a small commission for if people buy it from your site! Chelsea from Chelsea’s Messy Apron wrote an e-book about how she made $40k in her first year of blogging. Really interesting to follow her month-by-month journey! Ad networks. There are a lot of options these days, but be aware the many networks have their own minimum requirements before applying. I use (and love) Mediavine, and they require a minimum of 30k pageviews/month. 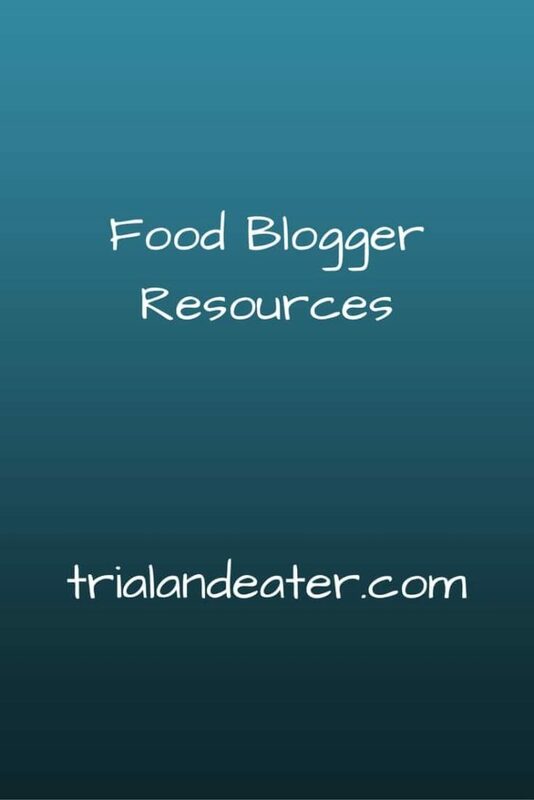 Food Blogger Pro – Hands down, the most helpful resource I’ve had so far. Seriously. Whether you want to learn how to take better pictures, how to gain more readers, or how to write your own e-book, it’s all here. The Blog Village – Another great community with lots of great resources. They have a whole workshop about how to make awesome food videos, and are super responsive to their members. PODCASTS – I’m a little obsessed with podcasts. Some of my favorites include: Food Blogger Pro, Chopped Podcast, ProBlogger, Goal Digger, The Fizzle Show, and The Model Health Show. I hope you find what you’re looking for, but let me know if you don’t! Check back here or Sign up to receive special updates when new blogging resources are added and exclusive discounts for classes with limited availability!